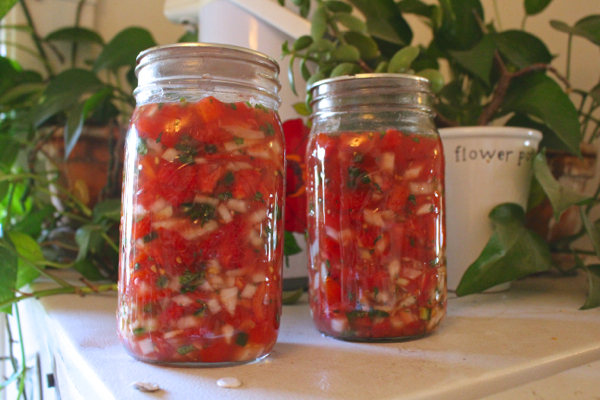 Homemade fermented salsa has been on my list for a long time. I’m not sure why I hesitated to try it because it’s so easy to make! Fermentation produces probiotics which are essential for a healthy gut. Our family eats a spoonful of fermented food such as sauerkraut, kimchi or fermented vegetables at each meal, so adding salsa to the list is a fun addition. All that’s required for this salsa recipe is tomatoes, onion, cilantro, lime juice and sea salt. The ingredients sit in a jar for two days in the pantry. After 48 hours you’ll have fermented salsa that you can use for dipping or to serve with grilled meats, eggs, vegetables, etc. You really need to give this one a try! You can add or subtract ingredients from this recipe to come with your favorite combination, but don’t leave out the salt. The salt is needed to ferment the salsa. I know it seems like a lot, but it’s necessary and the salsa won’t taste overly salty. If you’d like a smoother salsa, then put all of the ingredients in a blender or food processor and blend until the desired consistency before fermenting. Place all ingredients in a bowl and toss until incorporated. Spoon the salsa into 2 large mason jars (or any other glass jar you prefer). Gently press the mixture so the juices cover the salsa. Loosely screw the lid on top of the jar. Place the salsa in a dark, cool spot in the pantry. Let sit for 48 hours. You’ll notice if you stir the salsa there will be bubbles. That’s a good thing! It means the salsa has fermented. Store in the fridge. The salsa keeps for about 4-5 days in the fridge.